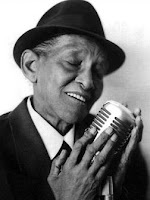 My favourite jazz vocalist of all times, little Jimmy Scott, performed at the Blue Note Jazz Club in the West Village last week and I got tickets for me and the Boy as soon as I learnt about it. Jimmy Scott has an incredibly unique voice and a lovely personality - the kind that makes you want to hug him and never let go. But at 86 years old, he performs less than a handful of times a year unfortunately. I first saw him in London and since I have moved to New York, I have made a point of seeing him every single time he has come to the City (only once a year) - twice at the Dizzy's Club in Columbus Circle and once at the Charlie Parker Jazz Festival. I had never been to Blue Note before and must admit that I was a little disappointed. The club clearly needs a make-over. What I like about jazz clubs is that they are usually small, intimate and frankly quite romantic with plenty of dark nooks that couples can snuggle into while enjoying the performance. But Blue Note (while being small), did not feel intimate at all and the fact that most tables are communal was neither romantic or practical. It also felt like a bit of a tourist trap, which I guess is to be expected as it is probably the most famous jazz joint in the City. If I was to recommend some good jazz venues, I would go with Dizzy's (for the panorama alone), as well as Smoke, a tiny brick-walled club on 105th and Broadway. But regardless of the venue, Jimmy delivered an amazing, emotional and almost heart-breaking (as he now so frail) performance that had me close to tears. I will continue to see him every year, for as long as he can perform - he is now in a wheelchair, so I'm afraid it may not be that much longer unfortunately. And the Boy passed a big test by enjoying it as much a I did!